Earlier in the year I read the online article "Unmarked Planes & Hidden Geographies" by Trevor Paglen in the Vectors Journal at USC. Different from the normal Area 51 and Dreamland internet conspiracy theory hogwash, it was a truly interesting take on the usage of open source intelligence (or OSINT as they call it in the biz). Since I was staying at the Luxor hotel in Las Vegas a few weeks after I read this, I decided to see what I could do with a digital point and shoot camera. 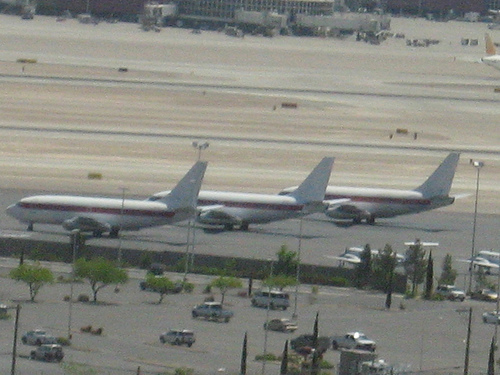 With 16x zoom (4x optical and the rest digital) I couldn't make out the tail numbers, but it just shows that there are only a few thousand yards between secrets and slot machines in Las Vegas.